Gold at Pan Am Champs - Juventus half of WTP! 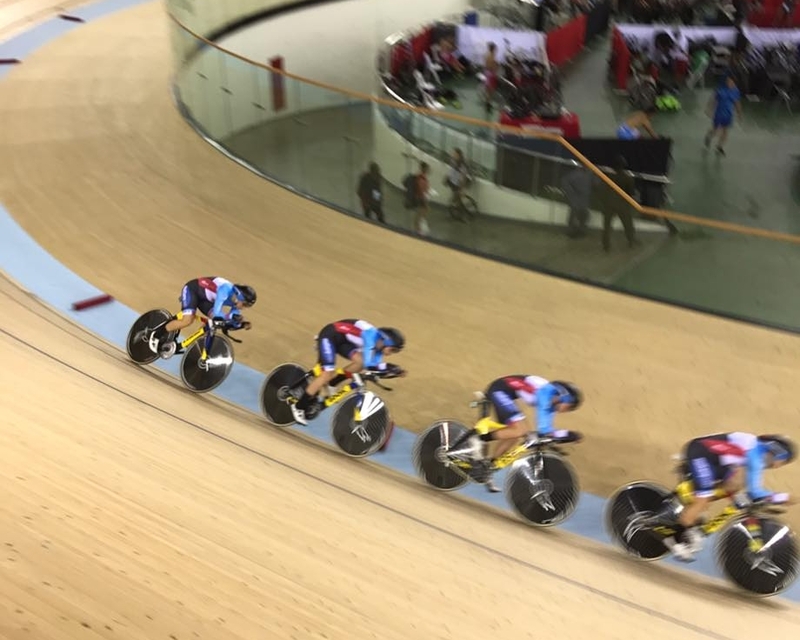 The 2017 Pan American Track Cycling Championships were held August 30th - September 3rd. Canada opted to send a full NextGen team, along with coach Jenny Trew, to defend the Women's Team Pursuit title from 2016. Juventus team members Kinley Gibson and Devaney Collier were part of the team, along with fellow NextGen teammates Ariane Bonhomme, and Meghan Grant. 2017 Women's Team Pursuit Pan Am Champions - Ariane Bonhomme, Kinley Gibson, Meghan Grant, Devaney Collier with supercoach Jenny Trew. The women arrived in Trinidad, and had a couple of days to figure out the best lines on the track. In the qualifier, they finished with a time 6 seconds faster than the second place Mexicans. They felt that the ride could be improved, and in the gold medal final, put together a much better performance - catching the Mexicans to win the championship. Kinley Gibson launches for the final, with Ariane Bonhomme P2, Meghan Grant P3, and Devaney Collier P4. The Canadian NextGen Women in action.